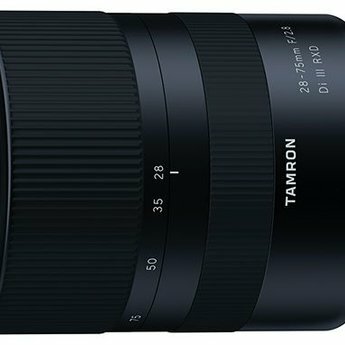 Blending a sleek form-factor with a versatile working range, the 28-75mm f/2.8 Di III RXD from Tamron is a full-frame-compatible lens for Sony E-mount mirrorless cameras. Spanning wide-angle to portrait-length, a constant f/2.8 maximum aperture complements this range and affords increased control over depth of field along with enhanced low-light performance. Benefitting the optical design is an RXD stepping motor, which enables quick, near-silent autofocus performance to suit stills and video, along with full-time manual focus override and a minimum focusing distance of 7.5". Suiting this lens's use in harsh climates, it also sports a moisture-resistant construction along with a fluorine-coated front element to protect against fingerprints and smudging.